Each day, in ways large and small, learning with Apple technology helps the Shorecrest community collaborate, communicate, take risks, and think differently. Shorecrest is proud of its longstanding commitment to innovation, technology integration and preparing students for their futures. 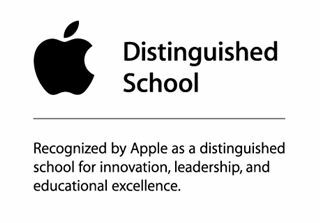 In the multi-touch book below, experience the Shorecrest journey of educational technology and innovation from its 1923 humble roots to its 2016-2018 Apple Distinguished School recognition and 2018-2021 reinstatement as an Apple Distinguished School. Shorecrest recognizes that proficiency with technology and the development of information and media skills is essential to a student's future success in academics, the workplace, and lifelong learning. Seventh graders embark on a nine-week interdisciplinary digital storytelling assignment in multiple classes to create original stop-motion animation movies. Small groups develop original storylines, work on character development, and write scripts for their movies. In art class, students create models of their characters out of wire, recycled bags, paint and fabric. Then English and technology classes merge for two weeks to film the movies using stop-motion animation apps on iPad devices. They edit the videos in iMovie on iMac computers, add sound effects, then showcase their films for preschoolers. Fourth graders try their hand at the world of game design with Scratch. After a short review of the elements that make up a video game, students choose a partner and begin to plan their projects. For the first few days, the teams of students develop a storyboard, paying close attention to audience and purpose. Ensuring equitable access for all students. Providing tech support and network services for all students. Empowering teachers to use technology for teaching, learning, and communicating through internal and external professional development opportunities. Utilizing technology tools to build community and foster collaborative learning within our classroom walls and beyond. Providing students with the technology skills necessary to succeed in a variety of learning environments. Educating students as digital citizens through the safe, ethical and responsible use of technology, information, and resources. Educating students and families about the personal and interpersonal impact of social media. In the summer of 2016, the International Society for Technology in Education (ISTE) released their refreshed ISTE Standards for Students. The new standards provide a framework for amplifying learning with technology. As part of the release, ISTE adopted the scope and sequence developed by Shorecrest’s Instructional Technology Team as a support resource for the new standards. View our K-12 Technology Skills Scope and Sequence. This graphic shows the foundational technology skills expected to meet the learning goals embedded in the ISTE Standards for Students. Additionally, these skills can increase productivity and enhance basic technical competence.